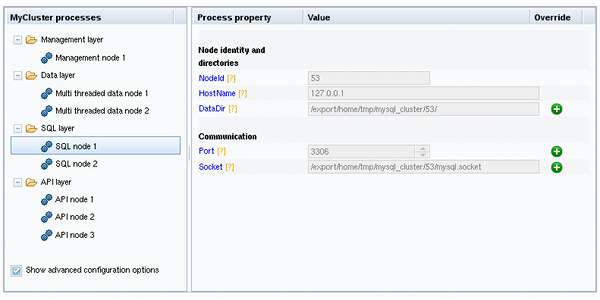 Define Attributes: Set configuration attributes for processes or types of processes. 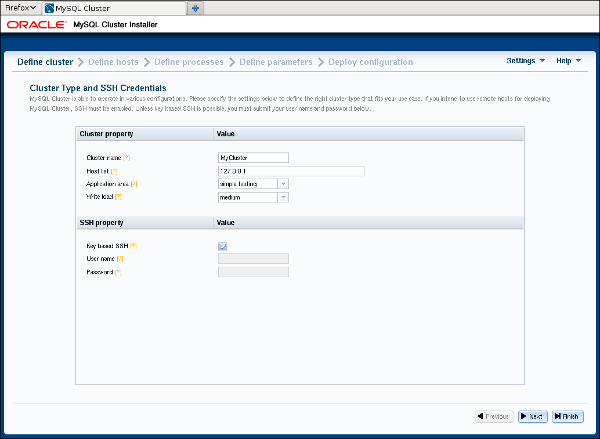 Deploy Cluster: Deploy the cluster with the configuration set previously; start and stop the deployed cluster. The following sections describe in greater detail the purpose and function of each of these pages, in the order just listed. 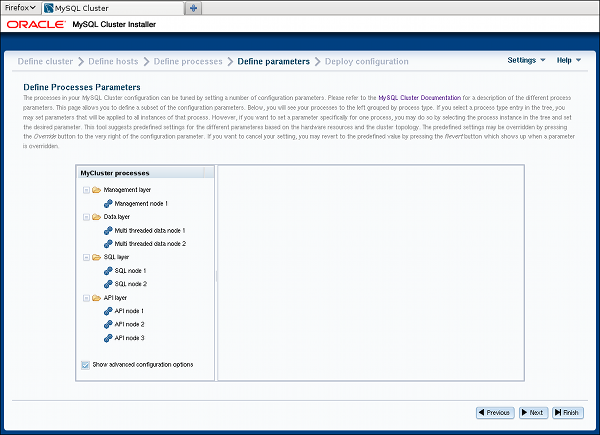 The Auto-Installer is provided together with the NDB Cluster software. 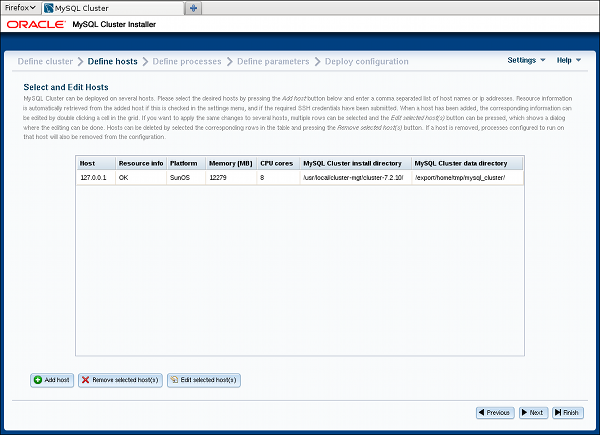 (See Chapter 4, NDB Cluster Installation.) The present section explains how to start the installer. You can do by invoking the ndb_setup.py executable. ndb_setup.py is found in the bin within the NDB Cluster installation directory; a typical location might be /usr/local/mysql/bin on a Linux system or C:\Program Files\MySQL\MySQL Server 5.6\bin on a Windows system, but this can vary according to where the NDB Cluster software is installed on your system. On Windows, you can also start the installer by running setup.bat in the NDB Cluster installation directory. When invoked from the command line, it accepts the same options as does ndb_setup.py. Navigate to the NDB Cluster bin directory in a file browser (such Windows Explorer on Windows, or Konqueror, Dolphin, or Nautilus on Linux) and activate (usually by double-clicking) the ndb_setup.py file icon. This works on Windows, and should work with most common Linux desktops as well. In either case, once ndb_setup.py is invoked, the Auto-Installer's Welcome screen should open in the system's default Web browser. In some cases, you may wish to use non-default settings for the installer, such as specifying a different port for the Auto-Installer's included Web server to run on, in which case you must invoke ndb_setup.py with one or more startup options with values overriding the necessary defaults. The same startup options can be used on Windows systems with the setup.bat file supplied for such platforms in the NDB Cluster software distribution. This can be done using the command line, but if you want or need to start the installer from a desktop or file browser while emplying one or more of these options, it is also possible to create a script or batch file containing the proper invocation, then to double-click its file icon in the file browser to start the installer. (On Linux systems, you might also need to make the script file executable first.) For information about advanced startup options for the NDB Cluster Auto-Installer, see Section 6.27, “ndb_setup.py — Start browser-based Auto-Installer for NDB Cluster”. 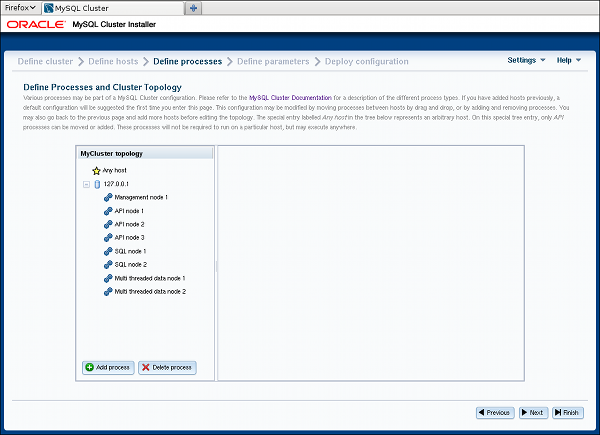 Create New NDB Cluster: Start the Auto-Installer with a completely new cluster to be set up and deployed. 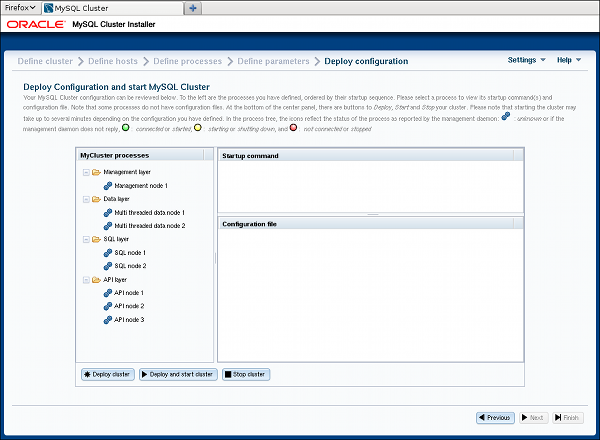 Continue Previous Cluster Configuration: Start the Auto-Installer at the same point where the previous session ended, with all previous settings preserved. The second option requires that the browser be able to access its cookies from the previous session, as these provide the mechanism by which configuration and other information generated during a session is stored. In other words, to continue the previous session with the Auto-Installer, you must use the same web browser running on the same host as you did for the previous session. Cluster name: A name that identifies the cluster. The default is MyCluster. Host list: A comma-delimited list of one or more hosts where cluster processes should run. By default, this is 127.0.0.1. If you add remote hosts to the list, you must be able to connect to them using the SSH Credentials supplied. Medium: The expected load includes 100 to 1000 write transactions per second. SSH Credentials: Choose Key-Based SSH or enter User and Password credentials. The SSH key or a user name with password is required for connecting to any remote hosts specified in the Host list. By default, Key-Based SSH is selected, and the User and Password fields are blank. The hosts currently entered are displayed in the grid with various pieces of information. You can add hosts by clicking the Add hosts button and entering a list of one or more comma-separated host names, IP addresses, or both (as when editing the host list on the Define Cluster screen). Similarly, you can remove one or more hosts using the button labelled Remove selected host(s). When you remove a host in this fashion, any process which was configured for that host is also removed. If Automatically get resource information for new hosts is checked in the Settings menu, the Auto-Installer attempts to retrieve the platform name, amount of memory, and number of CPU cores and to fill these in automatically. The status of this is displayed in the Resource info column. Fetching the information from remote hosts is not instantaneous and may take some time, particularly from remote hosts running Windows. If the SSH user credentials on the Define Cluster screen are changed, the tool tries to refresh the hardware information from any hosts for which information is missing. However, if a given field has already been edited, the user-supplied information is not overwritten by any value fetched from that host. For more information about process (node) types, see Section 3.1, “NDB Cluster Core Concepts”. Removing processes. To delete a process, right-click on a process in the tree and select delete process from the pop up menu that appears, or select a process, then use the delete process button below the process tree. 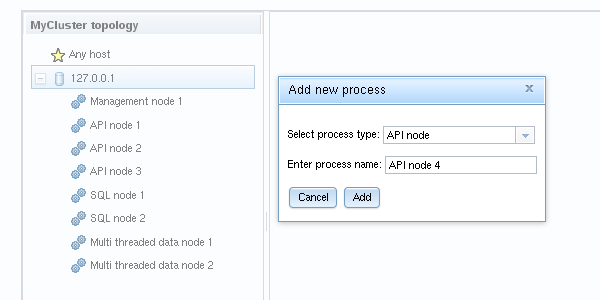 When a process is selected in the process tree, information about that process is displayed in the information panel, where you can change the process name and possibly its type. Important: Currently, you can change a single-threaded data node (ndbd) to a multithreaded data node (ndbmtd), or the reverse, only; no other process type changes are allowed. If you want to make a change between any other process types, you must delete the original process first, then add a new process of the desired type. The checkbox labelled Show advanced configuration, when checked, makes advanced options visible in the information pane. These options are set and used whether or not they are visible. Clicking the X button next to an attribute undoes any changes made to it; it immediately reverts to the predefined value. Like the Define Attributes screen, this screen features a process tree which is organized by process type. Next to each process in the tree is a status icon indicating the current status of the process: connected (CONNECTED), starting (STARTING), running (STARTED), stopping (STOPPING), or disconnected (NO_CONTACT). The icon shows green if the process is connected or running; yellow if it is starting or stopping; red if the process is stopped or cannot be contacted by the management server. This screen also contains two information panels, one showing the startup command or commands needed to start the selected process. (For some processes, more than one command may be required—for example, if initialization is necessary.) The other panel shows the contents of the configuration file, if any, for the given process; currently, the management node process is only type of process having a configuration file. Other process types are configured using command-line parameters when starting the process, or by obtaining configuration information from the management nodes as needed in real time. Deploy cluster: Verify that the configuration is valid. 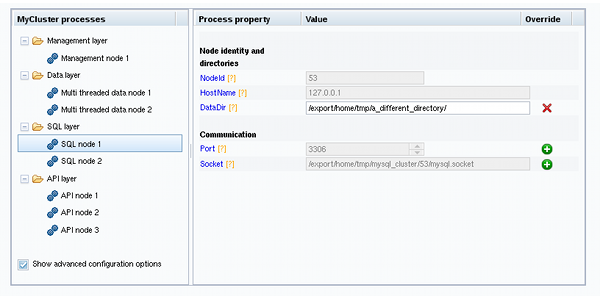 Create any directories required on the cluster hosts, and distribute the configuration files onto the hosts. A progress bar shows how far the deployment has proceeded. The process status icons adjoining the process tree mentioned previously also update with the status of each process. Stop cluster: After the cluster has been started, you can stop it using this. As with starting the cluster, cluster shutdown is not instantaneous, and may require some time complete. A progress bar, similar to that displayed during cluster startup, shows the approximate current status of the cluster shutdown procedure, as do the process status icons adjoining the process tree. 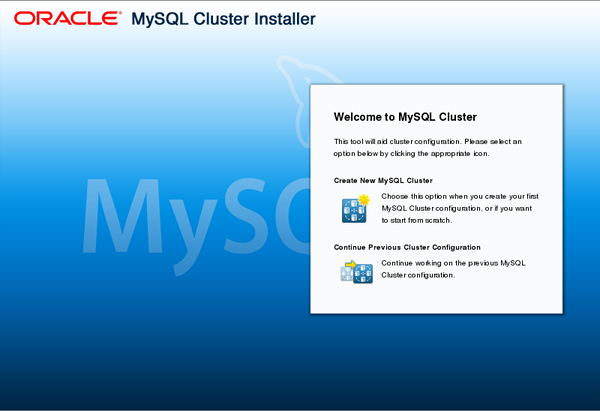 The Auto-Installer generates a my.cnf file containing the appropriate options for each mysqld process in the cluster.